Yes, I know how time flies, and must say this is the quickest I have ever made my chosen selection. I was assigned From Chapelhill to Chickenville this time around, and I think I made my assignment about two days later. 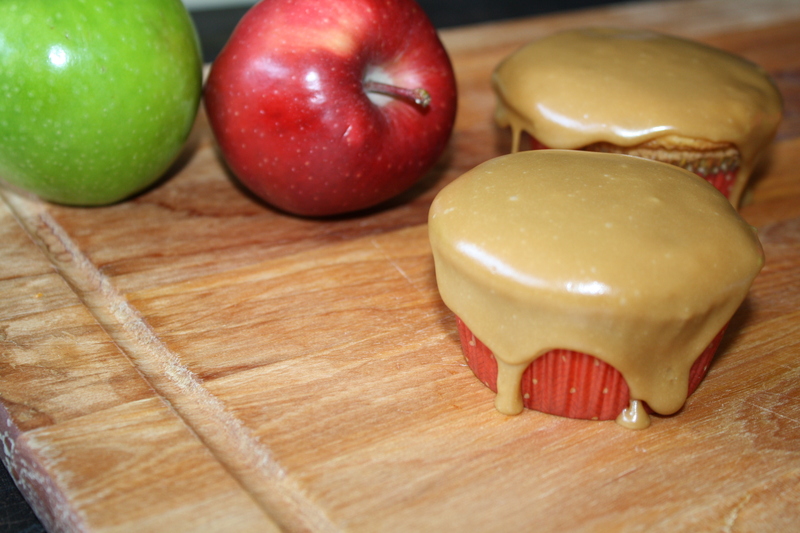 After reading through every single recipe I finally decided to give these Caramel Apple Cupcakes a try. They were delicious! Even my husband, a I would rather have chips than a dessert sort of guy, really liked them. I tried to whip that icing up into a frosting but mine still turned into more of a glaze but hey that was one yummy glaze and the caramel portion of this recipe makes your house smell divine. All my kids came in from the park proclaiming the house smelt like Christmas. Make these, enjoy these, I highly recommend! 1. Make cake according to package directions, stir in diced apples. Bake according to times on box. 2. To make icing melt together the brown sugar and whipping cream. Bring to a rolling boil. Boil for an additional minute, add baking soda, boil another minute. Remove from heat. Add butter but don’t mix it in, cool. 3. Beat frosting until desired consistency is reached. spread onto cooled cupcakes.